Not many people make a point of visiting Denton, Nebraska on their road trip. But we did. I can explain why. 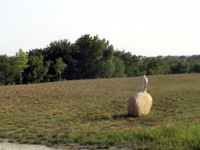 You see, we knew we would be going through nearby Lincoln, Nebraska. 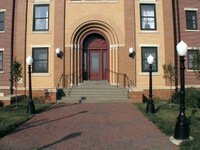 And we knew that a society of priests we really like, the Priestly Fraternity of St. Peter, has its North American seminary in Denton. So, when we arrived in Lincoln to stay with some friends of ours, we asked them how far away the seminary was. Turns out it was only a few minutes' drive. We discovered that the seminary was in the perfect spot for a seminary. It's out in a quiet, rural area on West Denton Road. Depending on where you're coming from in Lincoln, you can pick up West Denton Road off SW 12th Street, or South Folsom Street, or Warlick Blvd. And there it is. 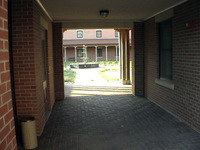 The main entrance to the seminary. 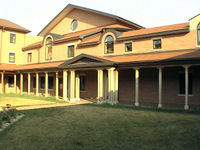 Young men come here to be formed in traditional Catholic spirituality. The priests of the Fraternity celebrate only the traditional Latin Mass. 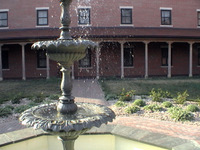 The fountain in the seminary courtyard. 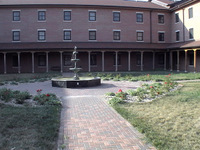 Standing in this courtyard was one of the most peaceful moments of our entire road trip. There's something quietly exhilarating about finding these little hidden spots along the course of your journey. This is when you stop and think, "Wow, I'm standing in rural Nebraska, staring at a fountain in the middle of an apparently deserted seminary!" There didn't seem to be anyone around, and yet the fountain was running. We guessed that there must be a handful of students and staff around to keep things running in the summer. It makes sense that the seminary would be quiet in July. Seminaries have school years like everyone else. Most or all of the seminarians were probably off doing summer assignments at parishes, or home visiting their families. As I mentioned, the seminary is really out in the sticks. There are some stunning views of the quiet countryside. I should have taken more pictures. But suffice it to say that if you're at all interested in seminaries, and you're passing through the Lincoln area, contact Our Lady of Guadalupe Seminary for a tour. A final look at the seminary before hitting the road. Since then, I've visited again and seen the beautiful, newly-built chapel as part of my tour from a very helpful seminarian. The point of all this? As you plan your road trip, don't forget that you can really see a lot just by going a little ways off the beaten track. The big attractions - Disneyland, the Rocky Mountains, the Mississippi River - are easy enough to find. But with a little research and extra driving, you can also visit places that have special meaning to you.